Where is the line between meticulous and just plain nuts? Because we’re sure Albert ‘Ash’ Aeschlimann crossed it at some point during this astounding build. 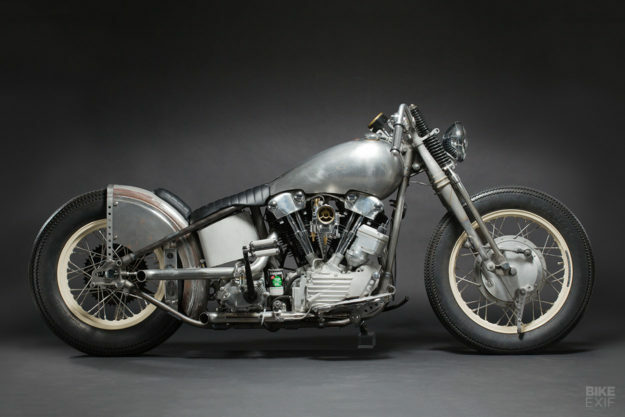 What started out as a simple ’48 Panhead frame turned into a seven-year project—with hardly any of the original bike remaining. Doing things ‘the right way’ is an essential part of Ash’s day job. He’s a technician at a major science museum in Switzerland, and before that, he studied architecture and worked as a carpenter. After hours, he makes magic in his workshop under the Ash Kustoms banner. Photographer Marc Schneider tells us that Ash’s obsession began at 20, when he got into vintage Vespas. 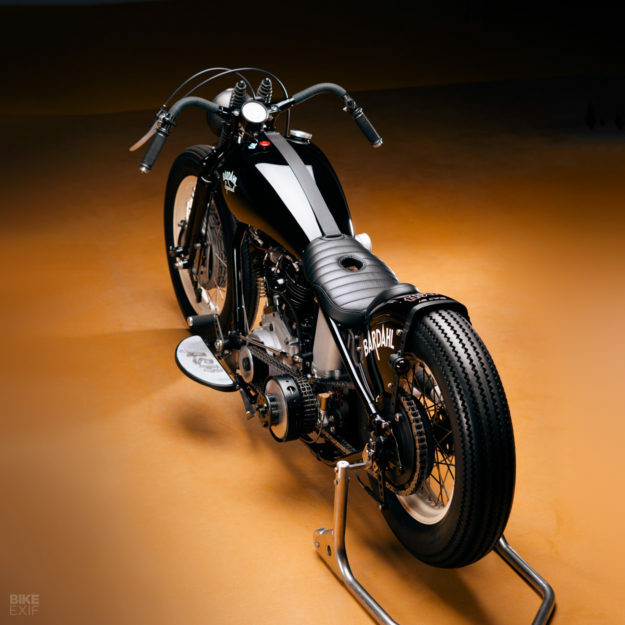 Then he saw the Indian Larry versus Billy Lane episode of The Great Biker Build Off, and was instantly hooked on custom motorcycles. These days he draws inspiration from Japanese builders like ACE Motorcycles and Heiwa. He’s self-taught, and handles most tasks himself—outsourcing only specialist stuff like upholstery, paint and casting. This project started off as a total basket case spread over multiple boxes. The more he tore into it, the more Ash realized that many of the parts were beyond repair, or not worth using. During the build, Ash decided to build himself a new workshop. That ended up taking three years—and by the time he was done, his ideas about custom bike building had shifted. So he binned a whole whack of custom parts he’d already fabricated for his Pan, and started over. The original 48 Panhead wishbone frame is one of the very few original parts now left. 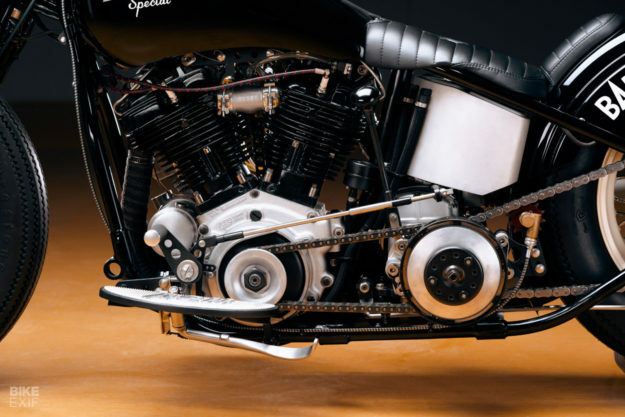 Wedged inside it is a 93 ci S&S Knucklehead motor, mated to a six-into-four transmission from Baker. But even though both the engine and gearbox were new, Ash just couldn’t leave them alone. He’s replaced all the Allen head fasteners with hex or slotted numbers, for a more retro vibe. The S&S motor is sporting some slick detail work. Ash designed a venturi-style brass insert for the intake, then had a jewelry maker cast it in brass. 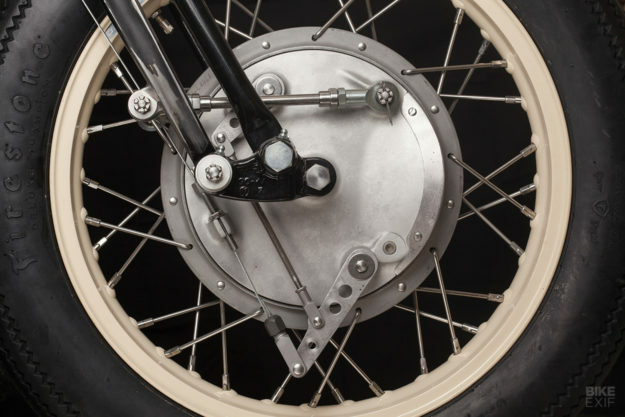 And the kickstart has been modified with a pedal from an old Swiss military bicycle—Ash machined a new stainless steel axle for it, and replaced the rubbers with knurled aluminum parts. 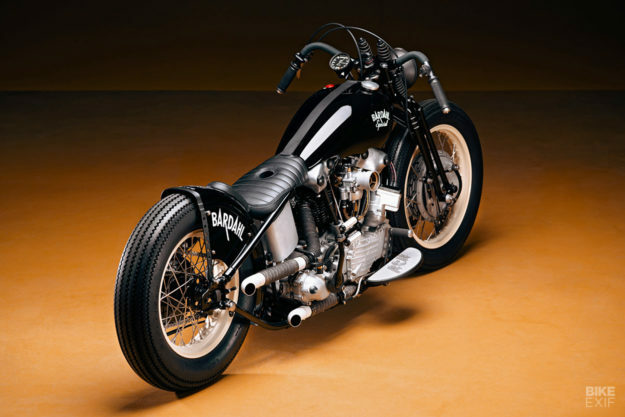 The Panhead now rolls on custom wheels, built up from 18F/16R Akront rims by Special Wheel Company in Ditzingen. With a 36-spoke hub up front and a 40-spoke hub out back, finding a matching pair of rims was quite a job. The rear hub is a Harley part with a hand-made cover. But at the front, Ash needed a big brake to cope with steep Swiss hills. So he’s used a repro Honda RC-162 system, with a hand-made air intake. According to Special Wheel Company, it’s the biggest drum brake hub they could fit to the 18” wheel. 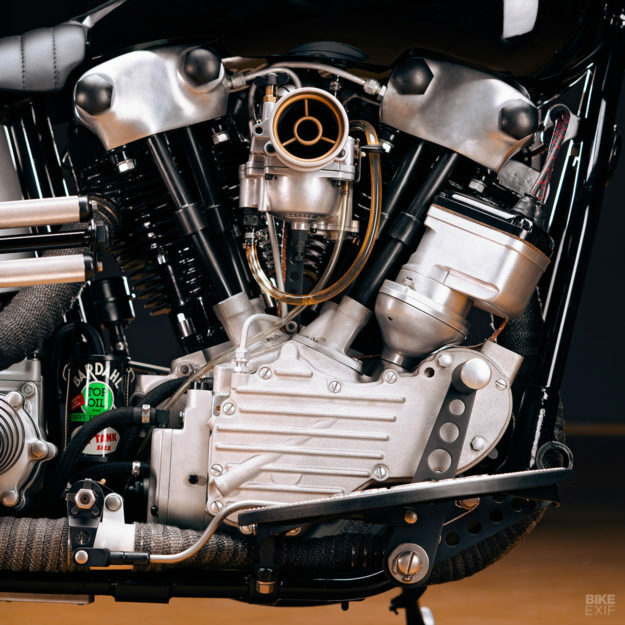 All of the Panhead’s bodywork is custom, hand-shaped by Ash in his workshop. 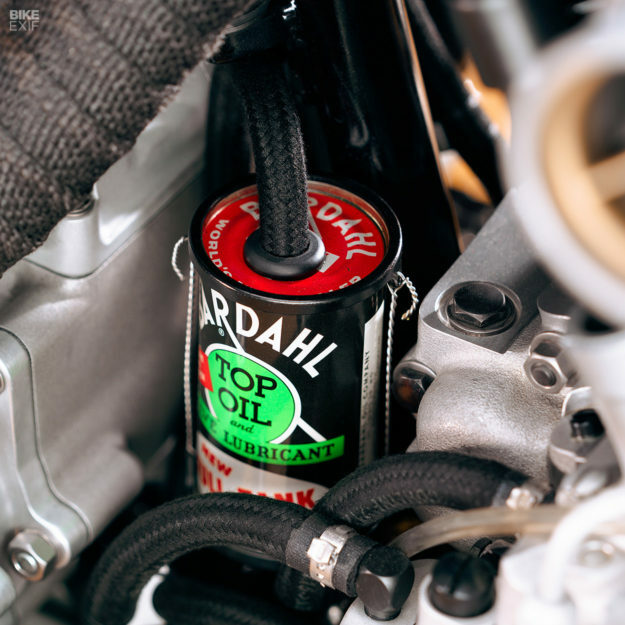 The oil tank’s particularly neat—Ash took inspiration from old hot rods, and decided to cast it out of aluminum himself. So he built a wood form, sand cast it in two parts, and welded it up. It wasn’t quite perfect, so he then painstakingly filled in any pores with his TIG welder. 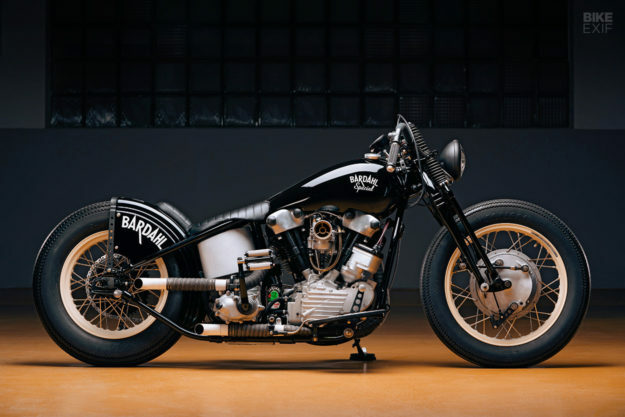 Almost everything else on the Harley is custom or modified. The front brake lever’s an original Panhead fitment modified for two-cable operation. The foot controls and their linkages were all made from scratch, and even the floorboards are one-offs. And what you can’t see, is that every pivot point has a brass bushing and washer. 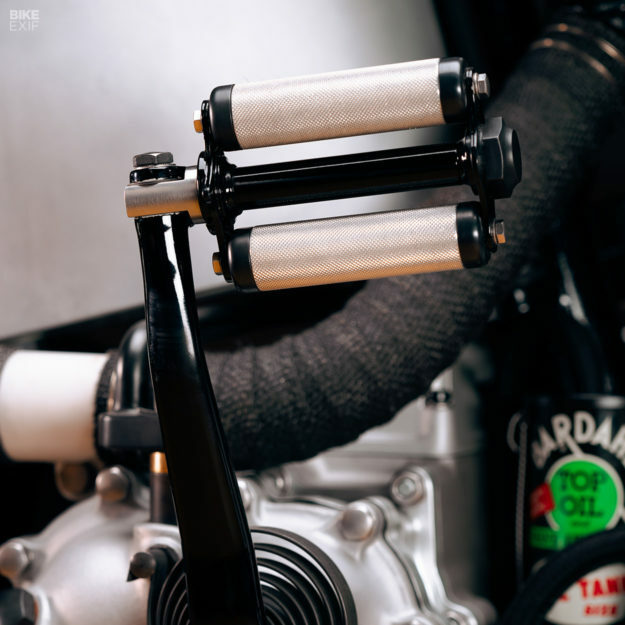 The handlebars are custom-made, and incorporate the light and horn switches—the latter taken from a classic Vespa. The speedo’s an old Smith Chronometric unit, and measures the speed at the secondary chain via an old Ford speedo cable. (Ash set it up like this purely so he could tuck the cable away). 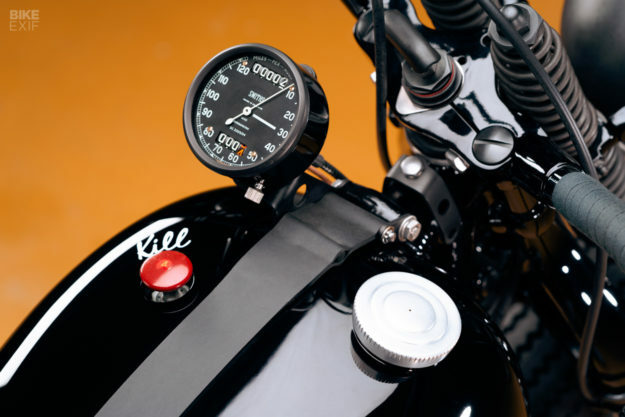 There’s also a Smith oil gauge, with a modified dial to match the speedo. The bike’s kill switch is from a B-17 Flying Fortress heavy bomber, and sits on top of the fuel tank. 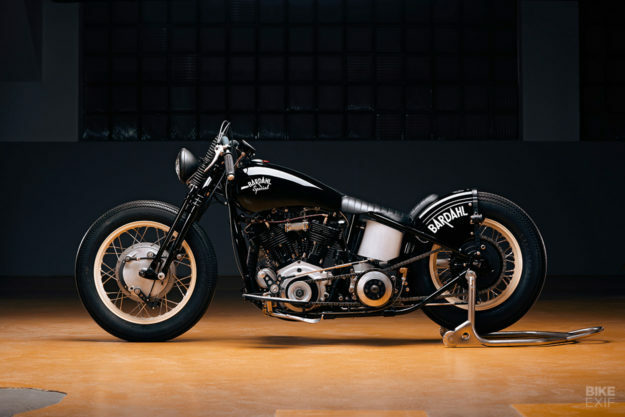 Ash used it as a homage to early bobber culture—when GIs returning from World War II started modding and racing motorcycles. A lot of Ash’s inspiration comes from airplanes and old race cars. In this case, it was the ‘Bardahl Special’ Indy 500 racecars from the late 40s. So he sought to replicate the deep, glass-like paint job sported by machines from that era. It took ten coats of black nitrocellulose lacquer to do the trick. Ash gave the job to the only company in Switzerland still allowed to use that type of paint: the Italian vintage car specialist Autolackiererei René Sahli. 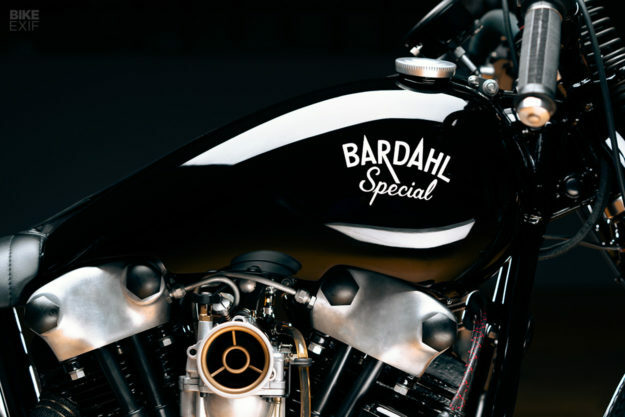 Other nods to the original Bardahl Specials include the gold rims, white exhausts, and the custom-made oil catch can. The saddle upholstery is just as exquisite as the livery. It has a hole in the center for quick access to the oil tank, which almost gave upholsterer Rene Wenger a heart attack. There are probably hundreds of details that we’ve missed—like the cloth-wrapped electrical cabling, the safety wiring, and the subtle drillium. 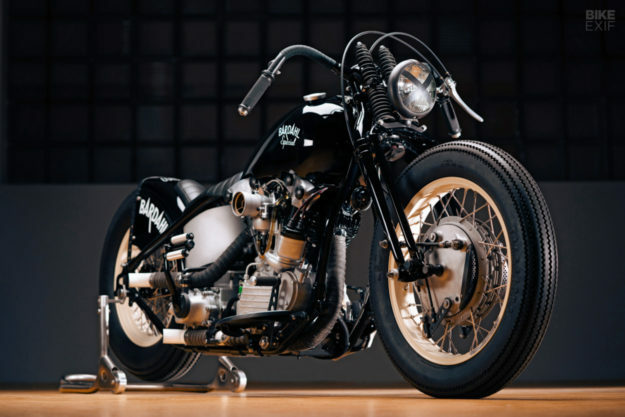 But whether you’re far away or up close, Ash’s Panhead is a stunner like no other.